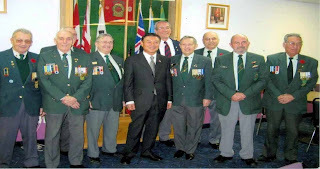 In the year of 2005 a new Unit of the Korea Veterans Association had been formed in Winnipeg Manitoba. Norm as the founding member took on the responsibility of doing the paper work,the by-laws of the new unit and procedures of KVA were written up and handed out to new members. The Charter was issued on the 30 Nov 2005 by the National President of KVA Les Peate. The following blog pertains to activities of this unit since its imception. On the 29 Th of Nov 2006 Unit 17 KVA had the honour and privilege of having Kim Sung-joon the Ambassador to Canada from South Korea visit them. Pictured above from L to R are George Hill, Larry Lagace Membership Chairman Unit 17 KVA, Robert Nisbet Past President Unit 17 KVA Mr Kim Sung-joon Ambassador to Canada from Korea, Armand Lavellee Honourary Member Chairman of the Joint Veterans Committee, Hugh MacKenzie President Unit 17 KVA, Walter Delipper Member of Unit 17 KVA, Mike Czuboka 2ND Vice President and founding President of Unit 17 and Derry McKinnon Sick and Visiting Chairman Unit 17 KVA. 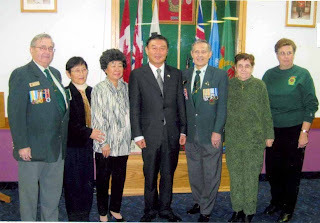 Pictured above with members of Unit 17 are L to R Robert Nisbet Past President Unit 17 KVA, Mrs Park The Korean Community of Winnipeg, Mrs Bong Jae Yim wife of Bong Jae Yim (Deceased Past President of the Korean Community of Winnipeg. (Rest in Peace Joe), Mr Kim Sung-joon the South Korean Ambassador to Canada, Hugh MacKenzie President Unit 17 KVA, Mrs Walter Delipper and Mrs Derry McKinnon. Pictured in the background is the cabinet built for the retired flags of Unit 17 along with 2 of the 303 rifles used in Korea by the troops at the time. Mr Doer was also presented the Patriot award along with General Retired Crabbe. Mr Doer has long supported the actions of Veterans Organization in the Province of Manitoba and was awarded the Patriot award for his strong dedication to Veterans in the Province of Manitoba. This award is presented for exceptional and rare patriotic action on the part of an individual, group or corporation to recognize Manitoba's and Canadians for their outstanding and exceptional support to Canada's defence and to our allies. The award may be presented for a singular act or for a long time commitment to our allies and to the men and women who serve in Canada's armed forces. This award was established in 2001.
of the word. As a young boy growing up in Neepawa he never thought he'd end up in the army bu what a career move it turned out to be, in rising thought the ranks General Crabbe remained a soldier's soldier while undertaking some of the most exciting jobs the army had to offer. On retirement from the military General Crabbe did not sit back to a life of leisure but continued to work hard for Canada and the military. He chaired a United Nations committee tasked to develop rapid deployment forces in several countries. He still teaches at the Defence College in Toronto. 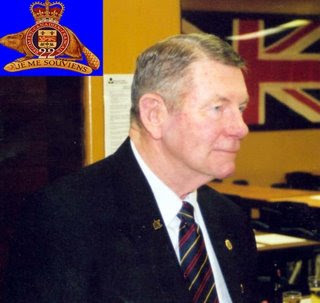 He proudly serves as a volunteer board member of Commissionaires Canada and at Southport Aerospace and is a past president of the Royal Military Institute of Manitoba. Lieutenant - General Ray Crabbe is a real patriot. On behalf of the Canadian War Museum I would like to again thank you for having brought the wonderful presentation case, containing the Sergeant Thomas Prince full size replica medal set and other significant related materials, to us on behalf of the Korean Veterans Association of Canada. We would ask that you pass along our thanks to the Association and in particular Mr Norm Van Tassel who created and put the case together. The Museum has now registered this presentation case into our Corporate Collection (An # 20060082-001), where it will be held for possible future exhibition or loan. Enclosed also is a disc containing a few digital shots of the presentation here at the CWM on July 31st 2006. 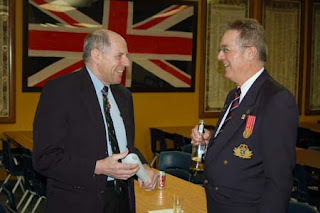 General Crabbe and Barry Burns in discussion after the presentation of the Tommy Prince Plaque at the St James Legion Mar 31 of 2006. 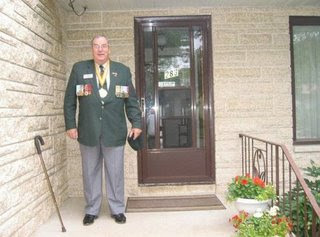 Barry has been a great help not only to our organization but many other Veteran organizations in the City of Winnipeg. He has often taken on the task and duties of the MC and has done a job that very few could do. Barry gets very little recognition for the support he gives and shows for organizations and we can only say "Thank you Barry" and we certainly appreciate your help. A very special thanks has to go out to Betty Zarney President #4 RCL, Jim Holland Past President #4 RCL , Minister of Cultural Affairs Mr. Eric Robinson , Local MLA Bonnie Korzeniowski, Greg Dewar MLA Selkirk & Brokenhead, Peter Chief the Rep from Brokenhead, the two sons of Sgt Tommy Prince both named Tommy, Paul Rochon KVA National Honours & Awards Chairman, the many Veterans Organizations as follows - The Army Navy Veterans Association, the many Branch reps of the Royal Canadian Legion, Bill Neil the War Amps, George Peterson the Hong Kong Veterans Association, Seymour Blackadar the Merchant Navy Association, Members of KVA Unit 17, Sam Katz and Graham Dixon the Jewish Veterans Association, Members of the Lt Gen RR Crabbe Chapter CAVUNP, Ron Parkes Vietnam Veterans Association, Members of the Aboriginal Veterans Association, Members of the RMIM, Don Mackey the Tommy Prince Memorial Fund Chairman and the Reps from the Cadet Corp RCAF and the Sgt Tommy Prince Cadet Corp. To the Ladies Auxiliary of the Legion for putting on the lunch and donating the cost of the lunch for the special event we thank them and #4 Legion for being a great host and allowing us to use their facilities as our home base. You all made this a very successful event. 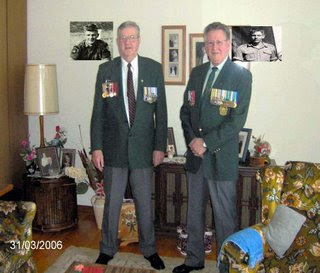 The two sons of Sgt Tommy Prince MM both named Tommy and Paul Chief a Rep of the Brokenhead Indian Reserve, Tommy's Home Reserve. They were in attendance at the presentation of the Plaque of their father to Gen Crabbe who will ensure that the plaque is put in it's place of honour at the Canadian War Museum in Ottawa. Thomas Edward Prince (Left in picture) passed away on June 30, 1970 he was born on July 17, 1943 mother was Olive Sinclair. Thomas died from Leukemia. the 9th of Aug 2004. Money was raised through the many different Veteran Associations and Government agencies in the Province and some Federal help. The project was taken on by Norm Van Tassel while President of the LGen RR Crabbe Chapter of the CAVUNP. Barry Burns of CJOB was our MC for the event. A parade took place and approximately 300 people turned out for the unveiling and Dedication.The province at the same time proclaimed the 9th of Aug Peacekeeping Day. 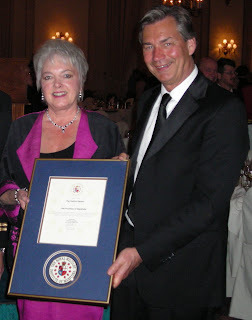 We thank Bonnie Korzeniowski, our local St James MLA for her assistance as well as Mr Gary Doer, the Premier of Manitoba. Several Korea Veterans lost their lives after the cease fire in Korea 27 Jul 1953 and were recognized as Peacekeepers on this day by General Crabbe in his opening address. We also had Dave Davidson, the President of the Korea Veterans Association of Canada visit with us and he addressed the group on behalf of the National Korea Veterans Association. We thank him for his participation. Norm Van Tassel didn't wear a blue beret when he was stationed in Korea in the 1950s, but he was a peacekeeper nonetheless. It was 1954 and a ceasefire had been declared between North and South Korea, two countries that had been engaged in a `police action' from 1950 to '53. Van Tassel and other Canadian soldiers were there as part of a United Nations force designed to ensure peace and stability between the two sides, who are divided by the 38Th parallel. They were quite literally keepers of the peace, but without the recognizable accoutrement's of today's peacekeepers. "(Peacekeepers) didn't start wearing blue and driving white jeeps until 1956 in Egypt and Cyprus and places like that," the veteran explains. Today, the 69-year-old feels good about his involvement in Korea and feels that his efforts, and the efforts of those who lost their lives, made a difference. "I remember something that one of my Korean friends said when they were honouring the Korean veterans at one of our get-together. He said, 'We are here in Canada because you Canadians were their (in Korea)," says Van Tassel, who is past-president of the LGen RR Crabbe Chapter of the Canadian Association of Veterans in United Nations Peacekeeping, as well as Past President of Unit 17 Korean Veterans Association and a past member of unit 46 Saskatoon KVA and the Prairie Region Sgt at Arms. Van Tassel's work didn't end after he left Korea in 1955, or after he retired from the military in the early 1960s. Since that time he has been active in fostering recognition for the efforts of Canadian soldiers and peacekeepers. 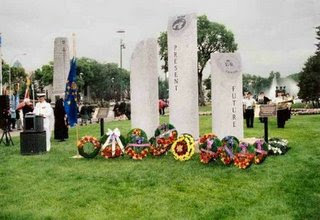 In 1998, while serving as president of Unit 17 of the Korea Veterans Association, Van Tassel chaired a committee that raised funds for the erection of a cairn in Brookside Cemetery to honour the 37 Manitoba servicemen who lost their lives in Korea from 1950 to 1955 and the 17 servicemen who were killed accidentally while travelling from Camp Shilo, Mb. to Korea 21 Nov 1950. Van Tassel also successfully lobbied the Manitoba government to have July 27 declared as Korea Veterans Day and Aug. 9 as Peacekeeping Day, one of the first Canadian provinces to do so. Van Tassel's most recent project was the erection of a cairn to honour the many Canadian peacekeepers killed in the line of duty. Armed with previous experience and contacts from the Brookside cairn project, Van Tassel says support for the endeavour came relatively easily. The cairn was officially unveiled on Aug. 8 to a crowd of approximately 300 people at its location in Memorial Park, at the corner of Memorial Boulevard and Osborne Street. "It was terrific," Van Tassel says of the event. 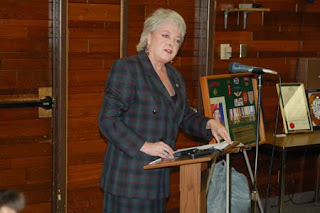 "General (Ray) Crabbe gave the opening address and we had representatives from all three levels of government and all the veterans associations out." A cairn at Memorial Park has been unveiled to honour Canadians who have died on United Nations peacekeeping missions around the world. The memorial cairn consists of three stone pillars, ranging from eight to 12 feet tall representing the strength of the Army, Navy, Air Force and RCMP. Each pillar is engraved with a single word - past, present and future - to signify the service and sacrifice of Canadian peacekeepers. "Canada was a founder of the UN peacekeeping force and thousands of our soldiers have served with distinction in countries in conflict around the world," said Manitoba Transportation and Government Services Minister Ron Lemieux. "Sadly, in meeting this great international obligation, many Canadians have made the highest sacrifice in the name of peace and this cairn is a tribute to their legacy. " The memorial is an initiative of the Lt.-Gen. R.R. 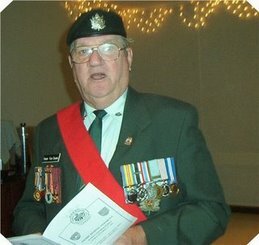 Crabbe Chapter of the Canadian Association of Veterans in United Nations Peacekeeping and is funded by the City of Winnipeg, Army, Navy and Air Force veterans associations, Royal Canadian Legion, War Amps of Canada, Jewish War Veterans Association, other military associations and private citizens. It is installed on land provided by the province at the corner of Memorial Boulevard and Osborne Street North. "It is a striking tribute to the memory of Canadians who have served and sacrificed on behalf of this country and our commitment to the peacekeeping role of the United Nations," said Crabbe. The United Nations was founded in 1945 and, in response to a Canadian proposal by future Canadian Prime Lester "Mike" Pearson, created the United Nations Emergency Force in 1957 to provide peacekeeping measures to member nations. Pearson received the one and only Nobel Peace Prize awarded to a Canadian for his proposal which ended an armed conflict in the Suez Canal region and was the template for future UN peacekeeping missions. A total of 154 Canadian soldiers have been killed during peacekeeping missions in Korea, Afghanistan, India, Pakistan, Indo-China, Egypt, Israel, Jordan, Lebanon, Syria, Belgian Congo, Cyprus, Vietnam, Somalia, Rwanda, Macedonia, Cambodia, Yugoslavia, Haiti and Serbia. Monday, August 9, has been declared Peacekeeping Day in Manitoba as part of the salute to Canada's UN veterans. Memorial Park also commemorates the sacrifices made by Canadians during the First World War, Second World War and the Korean War. Dave visited Winnipeg for and took part in the dedication of the Peacekeeping Cairn on Memorial Blvd. Dave was also very supportive in the formation of the new KVA Unit, The Sgt Tommy Prince MM Unit 76, which was formed in Winnipeg and donated money towards the Flags for the Tommy Prince Unit. We thank him for his support and his dedication to KVA. Retired LGen RR Crabbe had taken on the responsibility of ensuring the Plaque of Sgt Tommy Prince MM was presented to the CWM. This he did on the 31st of July 2006. The General has been very supportive towards the efforts not only of this association but many others in the City and Province of Manitoba. He has a Chapter of the Canadian Association of United Nations Peacekeeping named after him in the City of Winnipeg. He was very helpful in taking part in having a Cairn dedicated to those Canadians that lost their lives while on Peacekeeping missions. General Crabbe is also a native son of Manitoba. We Thank him for his support and guidance over the past years. 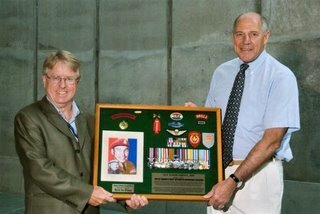 At the time of the Presentation of the Tommy Prince Plaque to General Crabbe. Paul was the Chairman of the National KVA Honours and Awards Committee and is presently the Vice President of the National KVA. Retired Major Graham Dixon a former member of the famous Royal 22nd Regt The Van Doo's because of his unlimited experience dealing with different organizations be it Government or Military Associations, has always been there to assist us in our endeavours to raise money, to sit on our committees and guide us to do what we needed to do to get the ear of those that we needed to assist us in our fund raising and to gain the recognition we were looking for. Mr Dixon has also worked very hard over the years with the Jewish Veterans Associations and is well know in the Jewish Community for his dedication and hard work. Mr Dixon is also a member of the KVA Unit 76 of Winnipeg, Manitoba. We thanks him for his hard work and for the direction he has given us . Mr Graham is presently the President of JNF Prairie Region and his address is listed below if more information is needed. 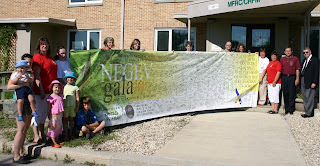 Winnipeg, MB: Recently, at the Negev Gala, presented by the Jewish National Fund of Canada (JNF), over 1,600 Manitobans displayed their support for the Canadian troops serving in Afghanistan by signing a large banner which will now be sent to the Canadian Forces base in Kandahar. While paying tribute to the Canadian Forces, the Negev Gala also honoured Mr. Arnold Frieman, a military veteran, successful businessman and community leader. In his acceptance speech, Mr. Frieman recognized that the Canadian Forces/NATO mission in Afghanistan is a noble one and that it is the duty and responsibility of free people everywhere to defeat tyranny and oppression wherever it exists. The JNF is proud to be sending the banner to Afghanistan to deliver a message of gratitude and respect for all Canadian Forces personnel. presents banner to Winnipeg Family Resource Centre staff and families: (from left) Sophie Berube, Ulysse Tremblay, Elizabeth Tremblay, Mona Currie, Savannah Tremblay, Drew Sherlow, Christina Brine, Cati Kopechena, Brittany Hynes, Matthew MacNeil, John Chabih, Haley Schroeder, Diane Brine, Sandra Doody, Don Brennan. 225 – 530 Kenaston Blvd. Bong Jay Yim was a very dear friend who was always there to lend a helping hand. He was very active in assisting in the needs of the Korea Veterans and was very generous in asking the Korea Veterans to attend functions put on by his group. 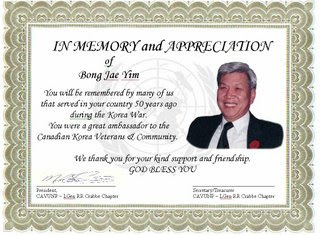 The above certificate was presented to his wife at a special function declaring the 27 Jul Korea Veterans Day in Manitoba by the Provincial Government. We thank Bong Jae for his support. We are here because you were there. Pictured above is Lynne Van Tassel and the widow of Bong Jae Yim, Mrs Chung Mi Yim. 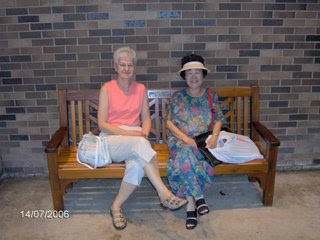 We met for coffee at the Winnipeg Conservatory where her family have a bench with a plaque on it dedicated to Bong Jae. That was one of their favorite places where they went to have a coffee and stroll in the park. We stay in touch with Mrs Yim and she misses her husband dearly. We wish Mrs Yim all the best in her time of need and hopefully her family will give her the strength to deal with her loss. All the bet to her in the future. Bonnie Korzeniowski Local MLA, St James, Manitoba. Bonnie's father was a Korea Veteran and retired from the Military as a WO II. Bonnie has been a great supporter of the military, in particular the Veterans and she has always been there to help and support them in matters that are important to the recognition and remembrance of our Veterans. Bonnie took an active part in the presentation of the Tommy Prince Plaque to Ret LGen RR Crabbe to be presented to the Canadian War Museum. Manitoba's veterans can drive their cars with pride, thanks to a new provincial license plate that identifies their status. The plates, which were unveiled to a crowd of veterans at the St. James branch of the Royal Canadian Legion, are modeled after the standard Manitoba plates, but with a few important changes: a poppy, is situated between the letters and numbers, and the word "Veteran" appears. According to provincial transportation and government services minister Ron Lemieux, who spoke at the unveiling, Manitoba is now the eighth province to honour its veterans with special license plates; an honour that's long overdue. Manitoba's government is very aware of the special relationship that exists between the province and the military, said Lemieux, especially our veterans. "For their efforts, we want to honour there with a kind of recognition that will travel far and wide to display, our pride in our veterans. We agree it's a fitting tribute." The plates, which were developed with the Royal Canadian Legion and the department of vehicle licensing, are available to any one from Manitoba who was a member of the armed forces, allied forces, merchant navy, or any peacekeeping missions. Current soldiers as well as some members of the Royal Canadian Mounted Police may also be eligible for the "veteran" plates. Legion volunteers look up each potential plate-owner to determine whether their claim as a veteran is legitimate. Although the plates themselves are free of charge, a five dollar administration fee is collected by the Legion. Cliff Tessier, the Legion's president for Manitoba and Northwest Ontario, said he felt the timing of the unveiling couldn't have been better. It is very appropriate, said Tessier, that our Provincial government not only made this possible, but that they did this at this time of year, just before the most important day for all Canadians, Nov. 11, Remembrance Day. "This is a day all Manitoba veterans will keep in their hearts forever." We also thank the Provincial Government for naming Highway 8 "Veterans Way" in the year 2005. 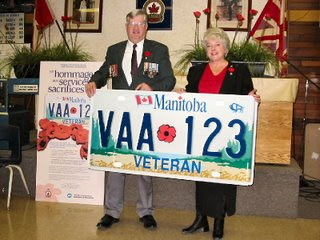 As of July 2007 there have been 4,100 Manitoba Veterans plates issued by the Command Office of the Royal Canadian Legion in Winnipeg, Manitoba. 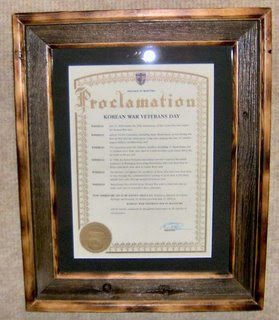 Our thanks goes out to Bonnie Korzeniowski, Eric Robinson and of course the Premier of Manitoba for declaring the 27 July 2000 as Korea Veterans Day in Manitoba. the day 27th Jul 1953 marked the day the Cease Fire occurred in Korea. The Canadians remained in Korea for another two years after the ceasefire. Members of the Last Post Fund of Winnipeg Manitoba. Front row L to R Bud Irving, Elden Thuen, Syd Parsen,. Back Row L to R Norm Van Tassel, Arthur Christensen, Len Johansson, Ron Elston, Rev Gord Shields and Gord Criggar. This organization is there to support all of our veteran that served in the Canadian Military. In Jun of 2007 Amalgamation of the Manitoba & Saskatachwan Branches took place and down sizing of the Board of Directors took place from 12 Directors to 6. Ken Garbutt will be the firat president of the new Branch and Ron Elson will be the firat Vice president. These appointments were mutually agreed to and have been confirmed by the Governing Council. Each will serve for two years and then the presidency will pass to a Manitoba Director and the vice presidency to a Saskatchewan Director. These two positions will continue to switch every two years. Members are requested to resign their positions as Directors to make the necessary changes in the organizations. We wish them good luck and all the best in the future. Claude Petit was born on October 31, 1935, in Duck Lake, Saskatchewan. He had one brother and a sister who passed away shortly after her birth. Mr. Petit's family has a long history of military service; his father fought in the Second World War and many other members of his family participated in conflicts dating back to the Riel Rebellion. Mr. Petit enlisted in the Korean War at the age of 16 and served with the 1st Battalion of the Princess Patricia Canadian Light Infantry. Claude is a former member of 2 PPCLI. He was wounded in Korea and recovered from his wounds to work with not only aboriginal veteran but Korea Veterans for many years in Saskatoon, Saskatchewan. 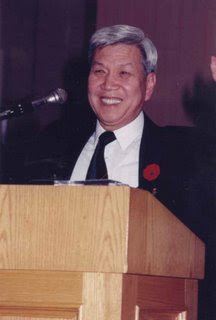 He served as President of Unit 46 in Saskatoon for several years and went on to become the National President of the Aboriginal Veterans Association. Hats off to Claude for all his hard work and dedication to Veteran. On April 7, 1981 Aboriginal Veterans who had served in he Canadian Armed Forces met and established the National Indian Veterans Association (NIVA). The lack of a satisfactory response from the Federal government in regards to inequities and mismanagement of veterans' benefits was catalyst to the launch of the new organization. Also, though several Veterans' association existed, such as the Royal Canadian Legion, The Korean Veterans Association and many regimental associations, there was none explicitly for the needs of the Aboriginal veterans. 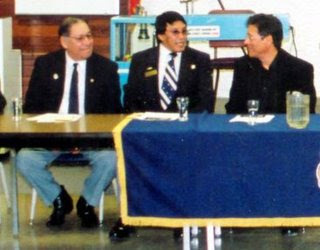 The founders of NIVA were aware that although Aboriginal veterans has served proudly alongside their fellow Canadians and Allied Forces, they felt that an Aboriginal organization was necessary to ensure remembrance of their fallen comrades and undertake initiative to support the needs of Aboriginal Veterans. On April 8, 1991 the National Indian Veterans Association (NIVA) was incorporated under the Canada Corporations Act. The founders envisioned that the new national organization would be an effective and unified voice for Aboriginal veterans. All funding to support NIVA was raised through various fundraising activities of the membership. On Jan 13, 1993 the organization's name was change to the National Aboriginal Veterans Association (NAVA) Association Nationale des Anciens Combattants Autochtones (ANACA) in order to better reflect the three Aboriginal peoples of Canada: Indians, Inuit and Metis. Under the renewed corporate charter the executive consists of a President, Vice President, Secretary, Treasurer and Sergeant -at-Arms. Meetings are held as required with a national meting and a special meeting occurring at least once a year. This organization is working very hard to meet the need of it's members the Aboriginal Veteran of Canada. Great article! 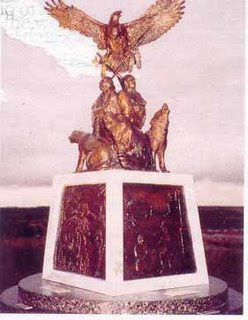 There is more information on the National Aboriginal Veterans Association Monument at Canada's Got Treasures, which is also a space where you can share your images, videos or other media.